to lead you to Paradise? 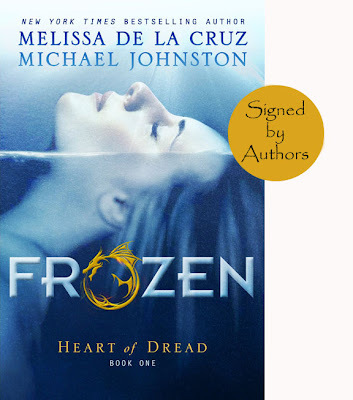 This is a paperback Advanced Reader Copy (ARC) of the first in a new series form Melissa de la Cruz, with Michael Johnston. The hardcover releases September 17, 2013. But why wait until September when Honestly YA gives you a chance to read it NOW? This contest will begin on June 28, 2013 and conclude at midnight July 4, 2013. I would love to write a book with Kasie West! We have similar writing styles, she creates fantastically realistic characters, and I think we could craft an excellent story together. J.K. Rowling or John Green! I think I'd pick Holly Black or Neil Gaiman, I admire both of them so much and their writing styles are amazing. I'd want to write with Meg Cabot because she's been one of my favorite authors since the very first Princess Diary book. I can remember scouring used bookstores for her 1-800-WHERE-R-U and Mediator series and the copies I own have her pen name, Jenny Carroll, on them! Thanks for doing such an awesome giveaway! That is easy! Either Jennifer Armentrout or Carrie Ryan. I love them both!! I'd ask one of my hs friends. Her imagination is out of control, which would be perfect. Rejection As Your "New Normal"?